Bailey has found her fur-ever home! Bailey's journey to her forever home took a couple of detours. A beautifully gray and white wooly with long fine fur and sparkling blue eyes, she first came into rescue when she was about two years old, and it didn't take long before she was adopted. Unfortunately, although they loved her very much, the couple who adopted her found themselves the parents of twin baby girls, who came along as a late surprise, in addition to their two teenage boys. Living in a townhouse with no fence and no time to give Bailey the exercise and long walks she craved, they finally decided to put her up for adoption as an Owner Surrender. 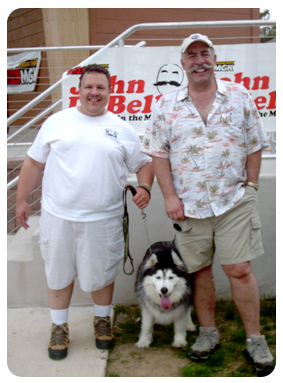 While she was still living with her owners, Bob, Betty Ann and their son Brian took Bailey to a couple of events, where she was an instant hit with everyone who met her - including John DeBella, a Philadelphia radio personality who hosts the annual DeBella Dog Walk. When a foster spot opened up in their home, Bob, Betty Ann and Brian decided to foster Bailey and she became a Jersey Girl. When she first arrived at their home, she looked totally different from the way she did just a few short weeks earlier because her former owners, thinking they were doing her a favor to keep her cooler during the summer, had her groomed and trimmed down to her undercoat (just think how you would feel running around outside in your underwear!). While she was still beautiful, Bob, Betty Ann and Brian could hardly wait until her wooly coat grew back in. After all, you can't be a Jersey Girl without Big Hair! Since she was supposedly available for adoption, Bob posted on her rescue page, "Somewhere out there, someone is singing, 'Bailey, won't you please come home!' Could it be you?" Little did Bob, Betty Ann and Brian realize that the singers were actually them! That's right. They failed Fostering 101 and Bailey finally found her forever home, where she enjoys long walks and playing fetch and tug with her toys. 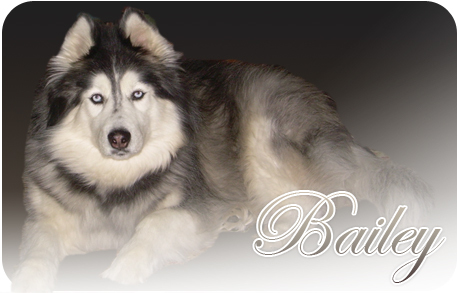 No one will ever again sing, "Bailey, won't you please come home." She already has.